Hi friends. I'm chawps, a multi-instrumentalist living in Brooklyn. I'm really excited to start tinkering with the axoloti. My current goal is to build a hardware looper/sample chopper, sort of a computer-less mlr device. There seem to be quite a few resources in the community library for that project, so hopefully it will be a good introduction to the axoloti world. I realized that I have been asking a lot of stupid questions here and there around the forum but never introduced myself. I'm Kat, and I live in the U.S. I am an ex-research-astrophysicist taking up musical hobbies (obsessions) later in life than most of you, I presume. I just started playing guitar a couple of years ago, and I've been building basic analog effects circuits for the last year. I like the way that I can combine effects design with songwriting... not doing anything profound, just writing guitar rock that I can also "sink my brain into" on the back end, if that makes any sense. While my audio-world and music-world experience is basically zero, I have decades of experience programming in a range of languages and doing lots of math-heavy signal processing. Once I catch on to the right ways to think about audio signals and all the Axo-specific data types and whatnot, I suspect some of that skill set may be useful....?? Project-wise, the immediate thing I am using Axoloti for is delay and looping capability that I can tweak a bit more directly than with a commercial pedal. But secondly, I'm interested in dynamic control of guitar effects, where the effect changes in response to things I am playing... I guess kind of thinking about songwriting itself a bit more like code, interactively designing effects algorithms as part of songs. Also just want to be noisy on behalf of women who find this kind of thing really cool. We exist! There seem to be very few of us on this forum, which is depressing! no such thing as stupid questions... we are all here to learn, share, enjoy and explore. welcome, I'm sure your going to have a lot of fun, sounds like you have lots of things that will help you on your journey. I am from Norway but currently live in Tokyo, Japan. I am an electronics engineer and make music as a hobby. I guess I am more of a knob turner than anything else. Sure I some times make a finished track, but it is not the end result, it is the journey for me. I don't play any instrument but recently bought a LinnStrument as it was the first instrument design that I really felt I would want to learn. (I tried and failed both piano and guitar). The axoloti's MPE capability was what made me buy it. I received it about a week ago and so far I have been having real fun when connecting it to my LinnStrument. They work really well together and I am impressed with the capabilities of this board and the amount of contributions from the community. I look forward to be part of it. Hey everyone ! I'm a french musician who really wants to buy an axoloti ! Do you think when It will be back in stock ? Hello, Phil here. I'm an old software engineer from the UK. My interest in synths goes right back to the days of Switched On Bach, Moogs and VCS3s. My Axoloti turned up a week ago, great fun. My Linnstrument turned up today. Hoping for some funs times when I get home this evening. Hope it will be available for you soon. Maybe you can have a look at audiofanzine, sometimes there is some second hand axoloti cores. Hello! Please make more boards. ...And I've bought one! Should ship on Tuesday. I'm hoping eventually I can combine it with a small keyboard for a nice compact backpack instrument I can take anywhere with me. Sylvain here ! Just got my first axo and waiting for a second one. I just got rid of all my modular setup to focus on some more practical ways to build bizarre sounds. I'm based in south west of France near Basque country and northern Spain. Proud owner of a brand new axoloti since last week, an starting to experimenting with it. Great power in such a little thing! Thanks for the amazing work to all the axoloti team. Also the community seems great, so I'm very glad to join it ! Ho, also... looks like there are a lot of Linnstrument users in this thread... One more here ! Hi, i ordered one yesterday, , haven‘t even got an email from axoloti, only my paypal payment confirmation. is that normal? do they have any contact? how long is shipping to germany? thanks! I think that's normal. I would say 7 to 10 days (that's what i waited for shipping to France). Hi there or "Moin moin!" as we say in northern Germany. My name is Torben and by day I'm an IT guy specialized in server virtualization technologies, but by night I become a musician/audio tinkerer. I've been playing classical guitar since I was 6 years old. When I got my first CD player, I got two CD's with it: A compilation of Western movie soundtracks and a compilation of syntheziser music including Tracks by Jan Hammer, JM Jarre and Vangelis. I started recording my music and using synthezisers and that's my main hobby since then besides restoring old instruments and amplifiers back to health, optimizing room accoustics and tinkering with Raspberry Pi's, Android, MAX for Live, PureData and now the Axoloti. My small studio consists of several guitars and basses (accoustic and electric), fitting amps (including my beloved Fender Bassman Silverface), a Hammond T200 organ, Hohner Pianet, Korg SV1, Nord Wave, Kawai K4, Yamaha CS1-X, several small synths (Reface CP, Waldorf Streichfett & Rocket, Akai Timbre Wolf...) and a slowly growing Eurorack modular synth. Axoloti cought my eye because of its MPE capability and I am planing to use it with a Seaboard, once I got a few good sounding patches programmed. I've been messing around with the stm32f4discovery board building a softsynth. I was thinking to myself: "This ST board is pretty good but it needs a few more things, like a better codec, built in midi, more ram for delay effects, etc. Somebody ought to build something bettter....". And here we are. The axoloti should arrive in a few days. Job 1 - add an axoloti target to my swd debugger. Job 2 - port my existing softsynth code to the axoloti. Job 3 - explore the official firmware/application. I'm from the south coast of the UK. My axoloti just arrived a couple of days ago. 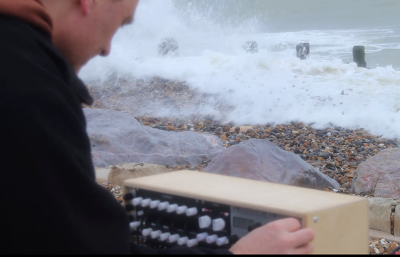 My focus at the moment is around making electronic music outside, in forests, beaches, up hills, that kind of thing. I've been using Symbolic Sound's Kyma system for a while and more recently eurorack and been doing a lot of work with feedback - mechanical feedback using contact mics and normal mic feedback over the air. My outdoor kyma setup has two flight cases, 4 twelve inch speakers, an inverter and an 18kg 12 volt leisure battery. In short, it's heavy. I was inspired by (mtyas) Matthew Tyas's youtube videos where he's playing in forests on a home made instrument built around an axoloti, and ordered one immediately I saw that! I want to make something small enough to take on overnight hikes up mountains. high! i'm a linux-based music producer from Kyiv, Ukraine. doing psytrance / electro industrial / TBM with algorythmic improvisations & live percussions (either finger pad kontrollers or full-blown e-drum kit). i found Axoloti as a lower latency, lower jitter alternative to a regular USB MIDI setup (which is horrible by design), and then discovered that its patching works very similar to csound (which i used to be obsessed with in the past), but better by design. my current live/jamming setup is DAW free. i prefer old skool, 80s style approach — computer for MIDI tasks and hardware for making noise. so, a linux-based laptop runs a few instances of 2 MIDI sequencers — free sequencer64 & proprietary B-Step Sequencer — but i hope to re-implement it all in Axoloti and make the whole setup laptop-free. for making noise, i use: Novation Nova Laptop (the best subtractive-virtual-analog synth ever made, period), preenFM2 (FM synth), Yamaha DTXPress III drum module, and another Axoloti. for tweaking it all, i use: Novation ReMOTE Zero SL Mk I, Korg PadKONTROL, and Novation Launchpad Mini Mk2 (this one is to be replaced with Launchpad Pro, because the latter has velocity-sensitive pads and proper MIDI connectors). all MIDI is routed via Axoloti-controlled Miditech Midiface 8x8, DIN connections always used where possible. for mixing and recording, Zoom LiveTrak L-12 is used. well, it's not that small as just a laptop with an audio interface, but fits 40L backpack anyway. and to make money for all this stuff, i have a full time job as Linux system administrator.